Read It Later, the popular service that lets you bookmark a webpage and access it later from any smartphone, computer, or tablet, has raised a $2.5 million funding round. The round marks the company’s first external funding, and includes investments from Foundation Capital (which led the round), Baseline Ventures, Google Ventures, Founder Collective, and several angel investors. RIL founder Nathan Weiner originally started the company back in August 2007, and he was the only person working on it up until early this year — during which time he built out the web product, multiple mobile applications, and a userbase of millions. As the service took off Weiner moved out to Silicon Valley where he received multiple acquisition offers, but decided to keep the company independent. He’s also started growing the team, which is up to five. Weiner wants RIL to “do for web content what Tivo did for TV content”, in the sense that it lets them consume what they want, when they want it. He says Read It Later also has a mission that similar to Drobox’s: it wants to give you access to that content on any of your devices, be it a phone, tablet, television, or computer, without having to think about where you saved what. At this point Read It Later obviously has a focus on written content, but people have already started using it to bookmark other things — in fact, the number one most saved URL on Read It Later is YouTube. Weiner says that the service currently has a total of 3.5 million registered users (though that includes users who aren’t active). And it’s showing strong growth, with 10,000 downloads per day and over 250 applications (including Twitter’s official app) that have integrated the RIL API. You can see a directory of these apps here. 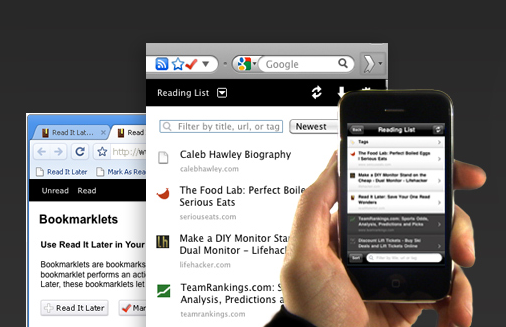 Of course, Read It Later isn’t the only service that lets you sync bookmarks between devices. Instapaper gets a lot of attention from the tech press (in part because it’s run by Tumblr’s former lead developer Marco Arment, and in part because it’s very well done). But Weiner says that Read It Later actually started before Instapaper and that its install base is around twice as large. He also points out that Instapaper caters primarily to users on iOS, whereas Read It Later offers official apps on more platforms (though Instapaper it does have an API, so there are non-official apps available for other platforms). And then there’s Apple, which launched a feature called ‘Reading List’ in the latest version of Safari that includes a lot of the same functionality. Weiner isn’t concerned about this — he says that Apple users are siloed and that the number of RIL users who use both iOS and Safari make up less than 1% of RIL users.